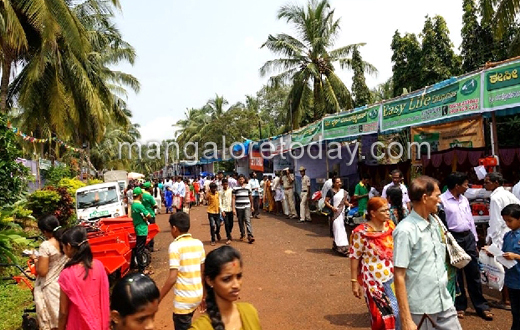 Udupi, Oct 12, 2014: The two-day Krishi Mela witnessed hordes of farmers coming from nearby and distant areas to get to know of new and modernized agriculture machineries. The exhibits in the mela exemplified an attempt to introduce the farmers with new technologies and breeds of agriculture and horticulture growths. However, the farmers who gathered in the Mela had mixed responses in terms of the benefits and knowledge they gained from the mela. Speaking to media, a senior agriculturist and who has two acre of land in the area said that the two-day Mela focused on the horticultural growths and the farmers who grow paddy do not have anything to learn. The exhibits displayed on the occasion are almost for the irrigation crops and not for the rainfall crops. ‘We are the marginal farmers and small land holders. The exhibition has nothing to offer to the small land holders and this is a repetition year after year. Icome every year,” he added. Meanwhile another senior farmer, more than 76 years old said that two days are insufficient to offer basic technical and other farming expertise to the farmers. It is impossible for the farmers to acquire skills of modern farming within two days, he added. Another aged 75, who comes every year to attend the expo says the Mela focuses totally on chemical fertilizers and the exhibition is not promoting organic farming in any sense. He also added that the people who are appointed to explain behave roughly and do not explain the new farming technologies that are displayed, he said. On the other hand, a farmer from Hebri stated that the exhibition is very useful to the farmers who go for dairy farming and that the exhibition has helped him to integrate many farming techniques into his farm and receive good yields, he added. The display comprised of modern technologies in implements like tractor driven disc plough, tractor driven string cultivator, seed and fertilizer drill, tractor driven cage wheel, rotary tiller, mini and medium power sprayer, mist blower, various patterns of power tillers, rotary weeder, power weeder, power reaper, motorcart, pressure washers, spike and drag harrow, chisel plough, rock wind rotator, harvester and so on. 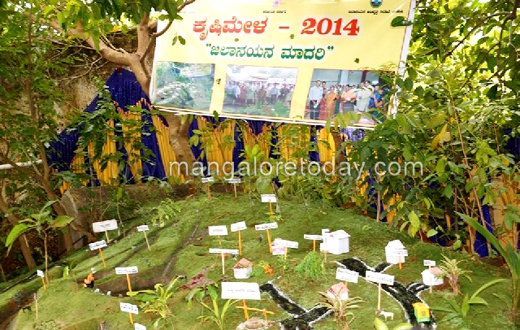 The varieties of paddy seeds like “Narang”, “Mahaveer”, “MO-4”, Jyoti”, “Muktha” were also exhibited. A demo was held on high yielding rice varieties and seed production. The expo comprised of demonstrations on preparation of Dapog nursery and SRI method of paddy cultivation, CO-4 fodder grass demonstration multi storied cropping system and nutrient management in coconut, cashew grafting and soil and water management in cashew garden, demonstration of organic manure compost, vermi compost and azolla, dairy, poultry, goat, rabbit, duck and fisheries demo units. Besides, there was demo on preparation of Bordeaux mixture, demonstration on value added food products, exhibition and sale of flower decorative plants were also held on the occasion. Seminars were held on “Cultivation of the horticultural crops” of the coastal zone, “Profit oriented integrated farming system” and “Scope for mechanization in agriculture”. 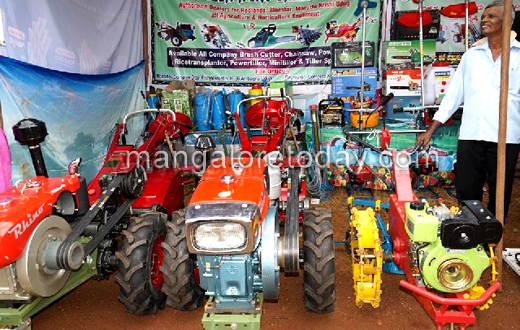 Around 125 stalls displayed various agriculture technologies and recent farm machinery. An appeal said that better approach in the melas must be considered for the future.